Having established the existence of other galaxies, Hubble and others began to observe them more closely—noting their shapes, their contents, and as many other properties as they could measure. This was a daunting task in the 1920s when obtaining a single photograph or spectrum of a galaxy could take a full night of tireless observing. Today, larger telescopes and electronic detectors have made this task less difficult, although observing the most distant galaxies (those that show us the universe in its earliest phases) still requires enormous effort. The first step in trying to understand a new type of object is often simply to describe it. Remember, the first step in understanding stellar spectra was simply to sort them according to appearance (see Analyzing Starlight). As it turns out, the biggest and most luminous galaxies come in one of two basic shapes: either they are flatter and have spiral arms, like our own Galaxy, or they appear to be elliptical (blimp- or cigar-shaped). Many smaller galaxies, in contrast, have an irregular shape. Our own Galaxy and the Andromeda galaxy are typical, large spiral galaxies. They consist of a central bulge, a halo, a disk, and spiral arms. Interstellar material is usually spread throughout the disks of spiral galaxies. Bright emission nebulae and hot, young stars are present, especially in the spiral arms, showing that new star formation is still occurring. The disks are often dusty, which is especially noticeable in those systems that we view almost edge on (Figure). In galaxies that we see face on, the bright stars and emission nebulae make the arms of spirals stand out like those of a pinwheel on the fourth of July. Open star clusters can be seen in the arms of nearer spirals, and globular clusters are often visible in their halos. Spiral galaxies contain a mixture of young and old stars, just as the Milky Way does. All spirals rotate, and the direction of their spin is such that the arms appear to trail much like the wake of a boat. About two-thirds of the nearby spiral galaxies have boxy or peanut-shaped bars of stars running through their centers (Figure 2). Showing great originality, astronomers call these galaxies barred spirals. As we noted in The Milky Way Galaxy chapter, our Galaxy has a modest bar too. The spiral arms usually begin from the ends of the bar. The fact that bars are so common suggests that they are long lived; it may be that most spiral galaxies form a bar at some point during their evolution. At the other extreme, the central bulge is small and the arms are loosely wound. In these Sc galaxies, luminous stars and emission nebulae are very prominent. Our Galaxy and the Andromeda galaxy are both intermediate between the two extremes. 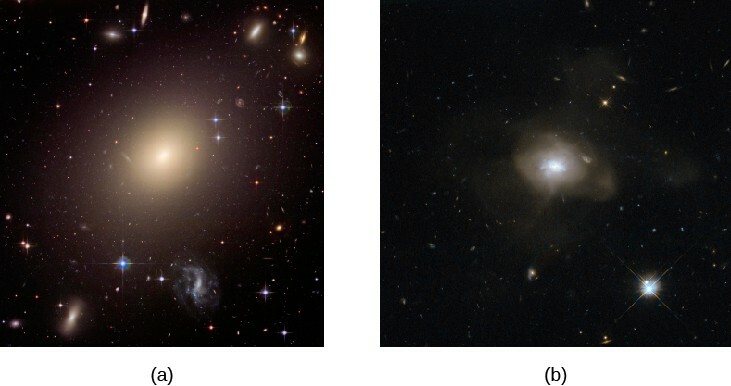 Photographs of spiral galaxies, illustrating the different types, are shown in Figure 3, along with elliptical galaxies for comparison. The luminous parts of spiral galaxies appear to range in diameter from about 20,000 to more than 100,000 light-years. Recent studies have found that there is probably a large amount of galactic material that extends well beyond the apparent edge of galaxies. This material appears to be thin, cold gas that is difficult to detect in most observations. 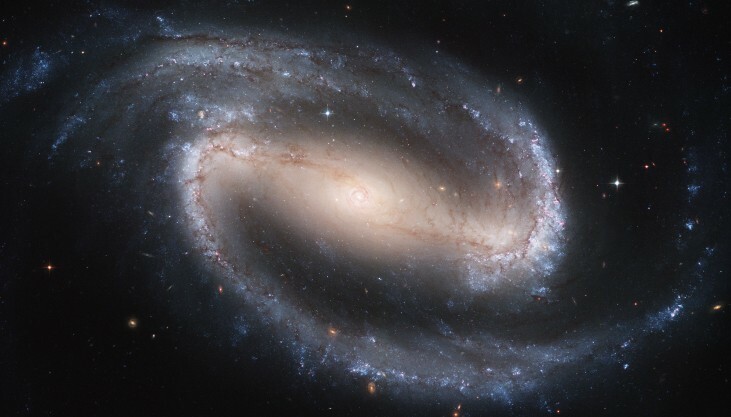 From the observational data available, the masses of the visible portions of spiral galaxies are estimated to range from 1 billion to 1 trillion Suns (109 to 1012MSun). The total luminosities of most spirals fall in the range of 100 million to 100 billion times the luminosity of our Sun (108 to 1011LSun). Our Galaxy and M31 are relatively large and massive, as spirals go. There is also considerable dark matter in and around the galaxies, just as there is in the Milky Way; we deduce its presence from how fast stars in the outer parts of the Galaxy are moving in their orbits. Elliptical galaxies consist almost entirely of old stars and have shapes that are spheres or ellipsoids (somewhat squashed spheres) (Figure 4). They contain no trace of spiral arms. 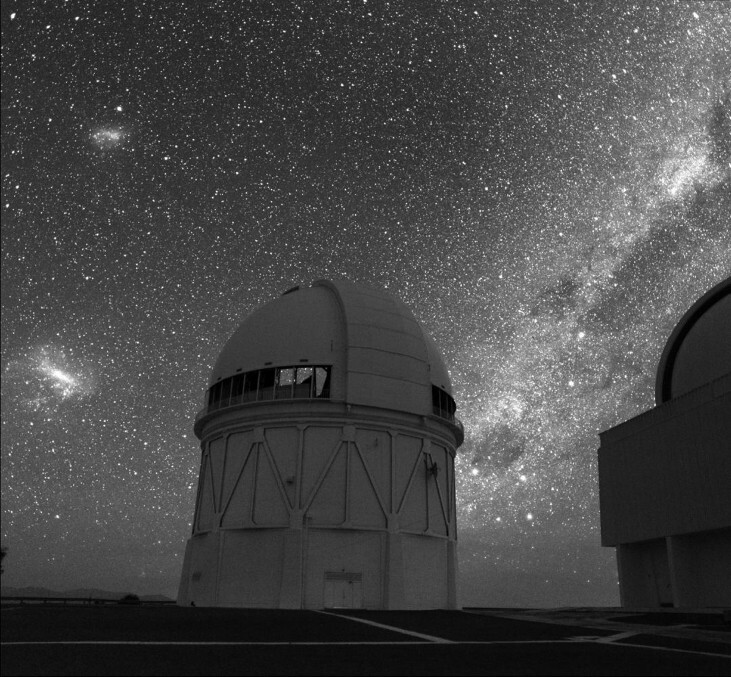 Their light is dominated by older reddish stars (the population II stars discussed in The Milky Way Galaxy). In the larger nearby ellipticals, many globular clusters can be identified. Dust and emission nebulae are not conspicuous in elliptical galaxies, but many do contain a small amount of interstellar matter. Elliptical galaxies show various degrees of flattening, ranging from systems that are approximately spherical to those that approach the flatness of spirals. The rare giant ellipticals (for example, ESO 325-G004 in Figure 4) reach luminosities of 1011LSun. The mass in a giant elliptical can be as large as 1013MSun. The diameters of these large galaxies extend over several hundred thousand light-years and are considerably larger than the largest spirals. Although individual stars orbit the center of an elliptical galaxy, the orbits are not all in the same direction, as occurs in spirals. Therefore, ellipticals don’t appear to rotate in a systematic way, making it difficult to estimate how much dark matter they contain. We find that elliptical galaxies range all the way from the giants, just described, to dwarfs, which may be the most common kind of galaxy. Dwarf ellipticals (sometimes called dwarf spheroidals) escaped our notice for a long time because they are very faint and difficult to see. 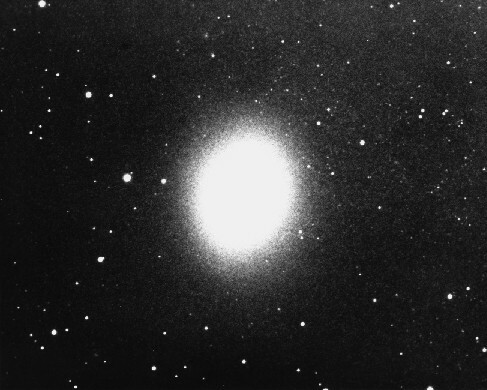 An example of a dwarf elliptical is the Leo I Dwarf Spheroidal galaxy shown in Figure 5. The luminosity of this typical dwarf is about equal to that of the brightest globular clusters. Intermediate between the giant and dwarf elliptical galaxies are systems such as M32 and M110, the two companions of the Andromeda galaxy. While they are often referred to as dwarf ellipticals, these galaxies are significantly larger than galaxies such as Leo I.
Hubble classified galaxies that do not have the regular shapes associated with the categories we just described into the catchall bin of an irregular galaxy, and we continue to use his term. Typically, irregular galaxies have lower masses and luminosities than spiral galaxies. Irregular galaxies often appear disorganized, and many are undergoing relatively intense star formation activity. They contain both young population I stars and old population II stars. The two best-known irregular galaxies are the Large Magellanic Cloud and Small Magellanic Cloud (Figure 6), which are at a distance of a little more than 160,000 light-years away and are among our nearest extragalactic neighbors. Their names reflect the fact that Ferdinand Magellan and his crew, making their round-the-world journey, were the first European travelers to notice them. Although not visible from the United States and Europe, these two systems are prominent from the Southern Hemisphere, where they look like wispy clouds in the night sky. Since they are only about one-tenth as distant as the Andromeda galaxy, they present an excellent opportunity for astronomers to study nebulae, star clusters, variable stars, and other key objects in the setting of another galaxy. For example, the Large Magellanic Cloud contains the 30 Doradus complex (also known as the Tarantula Nebula), one of the largest and most luminous groups of supergiant stars known in any galaxy. View this beautiful album showcasing the different types of galaxies that have been photographed by the Hubble Space Telescope. 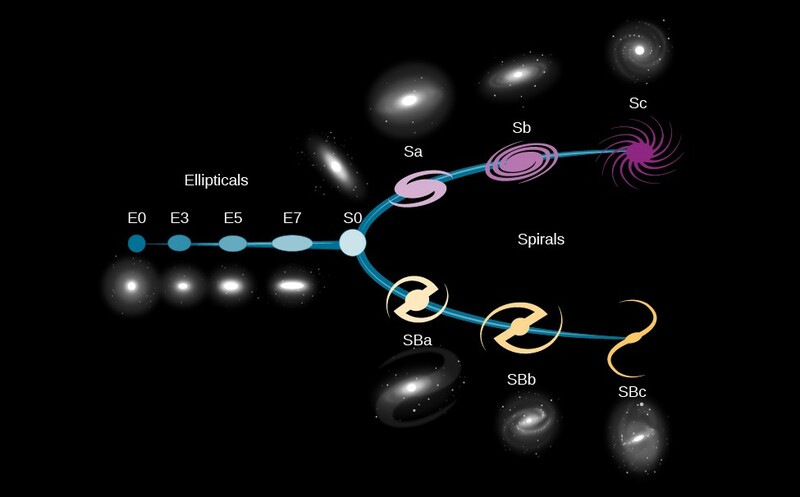 Encouraged by the success of the H-R diagram for stars (see Analyzing Starlight), astronomers studying galaxies hoped to find some sort of comparable scheme, where differences in appearance could be tied to different evolutionary stages in the life of galaxies. Wouldn’t it be nice if every elliptical galaxy evolved into a spiral, for example, just as every main-sequence star evolves into a red giant? Several simple ideas of this kind were tried, some by Hubble himself, but none stood the test of time (and observation). Because no simple scheme for evolving one type of galaxy into another could be found, astronomers then tended to the opposite point of view. For a while, most astronomers thought that all galaxies formed very early in the history of the universe and that the differences between them had to do with the rate of star formation. Ellipticals were those galaxies in which all the interstellar matter was converted rapidly into stars. Spirals were galaxies in which star formation occurred slowly over the entire lifetime of the galaxy. This idea turned out to be too simple as well. Today, we understand that at least some galaxies have changed types over the billions of years since the universe began. As we shall see in later chapters, collisions and mergers between galaxies may dramatically change spiral galaxies into elliptical galaxies. Even isolated spirals (with no neighbor galaxies in sight) can change their appearance over time. As they consume their gas, the rate of star formation will slow down, and the spiral arms will gradually become less conspicuous. Over long periods, spirals therefore begin to look more like the galaxies at the middle of Figure 3 (which astronomers refer to as S0 types). Over the past several decades, the study of how galaxies evolve over the lifetime of the universe has become one of the most active fields of astronomical research. We will discuss the evolution of galaxies in more detail in The Evolution and Distribution of Galaxies, but let’s first see in a little more detail just what different galaxies are like. The majority of bright galaxies are either spirals or ellipticals. Spiral galaxies contain both old and young stars, as well as interstellar matter, and have typical masses in the range of 109 to 1012MSun. Our own Galaxy is a large spiral. Ellipticals are spheroidal or slightly elongated systems that consist almost entirely of old stars, with very little interstellar matter. Elliptical galaxies range in size from giants, more massive than any spiral, down to dwarfs, with masses of only about 106MSun. Dwarf ellipticals are probably the most common type of galaxy in the nearby universe. A small percentage of galaxies with more disorganized shapes are classified as irregulars. Galaxies may change their appearance over time due to collisions with other galaxies or by a change in the rate of star formation.